The new update is finally ready to go! We know the update is a few days late, but the good news is, there are lots of new content. We’re always browsing the boards, so if you have comments or suggestions, please let us know! In this update, you will find more missions, both mainline and side quests, including a major arc where you upgrade the town’s harbor. You’ll find other new content such as the level 3 Assembly Station, the achievement system, you can also capture Colorful Llamas as the mounts! Let’s go into detail. We Solved the Language Input Issue! This is not a new content, but this is the issue that has been brought up several times by players (especially some Asian language inputs), especially in the negative reviews. We can’t remember how many times we got negative review because of it. But due to the engine itself, we weren’t able to do anything about it. Luckily, Unity had an upgrade and provided us a solution to solve this issue. So, in the new version of the engine, when you press any button combined with either the ctrl or shift button, the character will not freeze again. And you can still switch language input and type in messages. If anyone of you ever gave us negative reviews because of this issue, could you please change it back. Would very appreciate it, haha! A lot of missions were added in this update, including some exclusive NPC stories. 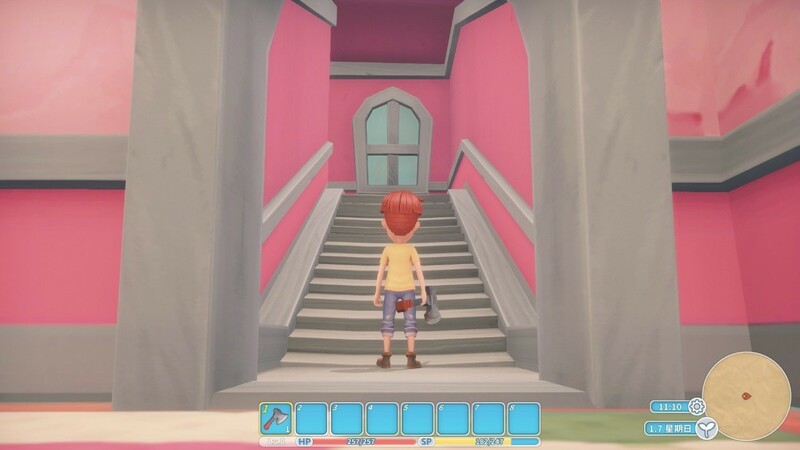 With more and more conversations and stories being added into the game, the Portia world has become much more lively and abundant. Here’s a little spoiler, we’ll have several new characters in this update, including the richest person in the Free Cities. Do you want to know more? Let’s find out in game! 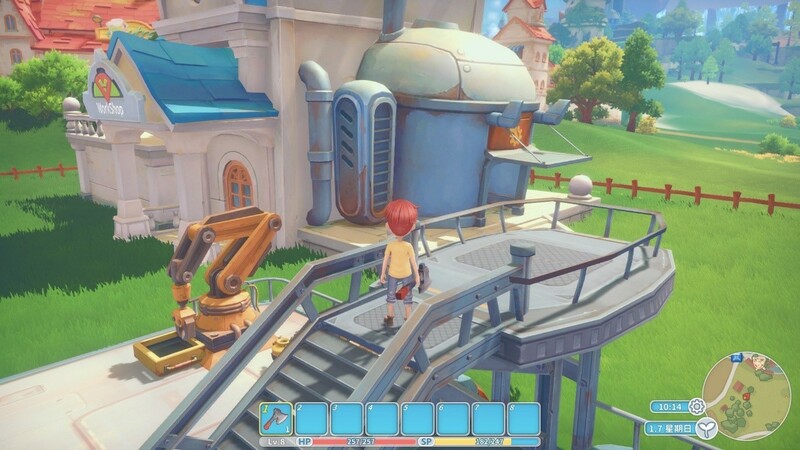 The fishing in Portia has been tagged boring, unchallenging, not-easy-to-operate, and earns too little by many players. So, this time, we’ve made some improvement. For example, we’ve expanded the range where the fish will take the bait and added more sound effects. More importantly, we’ve increased the reward for fishing. So, try it again! 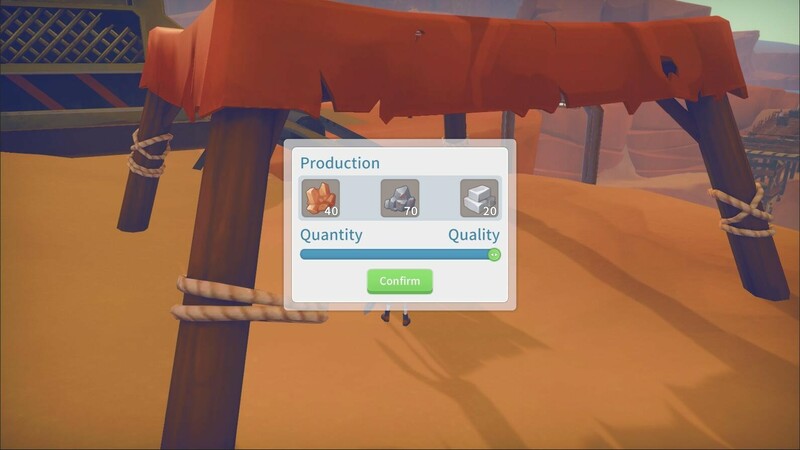 You can now make a lot money by just fishing in Portia. In this update, we’ve provided an operation near the old Ingall’s Mine to deliver ores for you. You’ll be able to receive ore deliveries in your resource box every day, as long as you completed the related missions. This could possibly change the way you play Portia, because this can decrease your time spent on mining every day. Besides the new Assembly Station, your house can also be upgraded. This time, you can go up to a level 4 house. You’ll not only have bigger rooms inside, you’ll also have a second floor and a more luxurious appearance. Looking at your new house standing on the level 3 assembly station. The stairway to the second floor. Also, we’ve added a very cool feature on the level 3 assembly station – it can automatically assemble items. So that means you don’t have to assemble machines piece by piece, instead, you will only need to input all the raw materials. Wooden Storage boxes – we received many complaints from players that when they have many storages and want to find a specific raw material to craft something, it’s very inconvenient and even annoying going through UI by UI. So, in this update, the crafting machines will find the raw materials automatically from your inventory and storage boxes. Helpers’ Storage – this is a new chest that you can craft in this update. When you have this chest, the helpers in your house - your spouse and Ack, will only use the fuel or materials from this storage. Resource Box – we’ve made some changes to this storage. The products that your helpers collect will be placed in here. So, you don’t have to ask for the products from the helpers anymore. Want to make your house more like home? You can hang your favorite pictures with your partner, friends, or families on the wall at home. This will make the house more comfort, cozy, and sweet. A much-desired feature. Some people might feel a little bit awkward when the only sofas you can dig out of a ruin are pink. 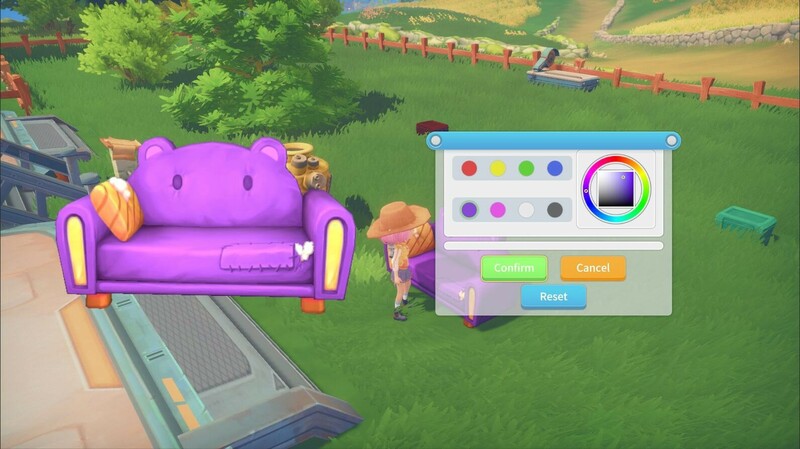 Now, in this update, you can dye your furniture to whatever color you want! If you don’t like the color, you can just change it to another one. But of course, you can change all furniture to awkward colors as well. There are much more content in this update, here are the rest! Added first version of Steam achievement system. Mission related achievements will be unlock if you've already finished the mission. Will add more in the next few updates. Added new main stories about Higgins, Flying Pigs adventurer Mali, fixing harbor, and long distance bus orders. Added missions about Gust and Ginger. Part of mission will only be triggered after marriage. Added sewing machine, which can upgrade character's outfit. Adjusted the research order and added an option to accelerate the research speed. Players will get the result based on their priority. Handing in more disks can speed up research progress. Assembly station can be upgraded to level 3, and can automatically assemble items. Home can be upgraded to level 4. When crafting items in the worktable, the system will find raw materials automatically from the bag and chests. Crafting can help to gain experience. Helper Ack and spouse collecting products can also gain experience. Added chests for helpers, so that the helpers can only use the raw materials and fuels from this chest. The helper will place all the products they've collected into the chest by the front door. Added smart dash in the fighting system. The character can dash to attack the enemy if they're in range. Added level 3 hazardous dungeon in desert. Added new fighting animation for Sam and Remington. Added more products in the inspection mini game. Can re-name the workshop at City Hall. Added new instructions in the Commerce Guild manual. Added attributes of dishes in the cooking recipe. Added the annual competition for the builders. The builders in the top three can get rewards from the Commerce Guild. Scores in the ranking system will be reset at the beginning of each year. Added consumables that can improve characters attributes permanently. Added one more room with several exhibition stands in museum. Added new decorations in A&G Construction. Added fish tank in museum. Player will get rewards when they collect all kinds of fish, and collect all Emperor fish. Added a venom shotgun. It can be crafted in level 2 worktable. Added colorful llama as a new ride. Can catch colorful llama in the wild. Added new elite snake monster. Items can be placed into backpack by pressing 'R' while holding them. Added new area - highland. Added IK. NPC will face the player when you say hi to them. Added more items for Pinky - including scratching board and cat tree. Ack will send player a gift on the 20th of each month. Added conversations for Mint, Mars, and Mei. Added the interaction animation - massage. Added item apology bear - to remove jealous status from NPC. Added/updated part of NPCs voice acting. The shortcut bar selection cursor can cycle through from last slot back to the first slot. Added bus route, so players can enjoy the scenery. A special UI will pop out when players get a new rare item. And the animation of opening a chest has been removed. Added picture frame. Can choose a picture from the album. Can change lip color in barber shop. Added home log, which will record two days events of helpers. Language input is banned while the player is moving. Added changelist and credit in the main menu. NPC can level up. Added one summer background music. Added light on miner's hat. Added the diagram for the water storage in Emily's Well 2. "Fishing system: Optimized the fishing UI. Adjusted the way bubble follows the bait. Optimized the camera while fishing. Adjusted the price of fish. Adjusted the ranking reward in Commerce Guild. Adjusted the initial money to 100. Re-arranged the buildings and terrain in harbor area. Adjusted the maximum distance to capture pictures. Adjusted the number of sending gifts to once a day. Added tip on the Commerce Guild board showing that no commissions are available at the weekend. Changed the trigger time of the mission - Meet the Shop Owners. Has changed to the next day of the workshop registration. The camera can move horizontally while upgrading the house. Mailbox will show the number of unread and read. Optimized the movement when placing the furniture. Any choice under Interact icon will not cost any stamina. Adjusted the location of dating while riding the horse. Moved the bus stop from hazardous dungeon front door to research center front door. Increased the sales price of the farm products. Dye can now be made in the blender instead of at the worktable. Fixed the bug that the dialogue box will pop up continuously after the inventory is full. Fixed the bug that when opening camera mode while petting, the icon of pet's mood will stay on the screen. Hid the icon of mailbox and resource storage in cutscene. Fixed the bug that players cannot send any gifts when on a date or playdate. Adjusted Paulie's location when he is star gazing. Fixed the bug that the players might get stuck in the dungeon. Fixed the bug that the character might disappear. If that happens again, please let us know. Thank you. Removed the string in the middle of the screen while dashing. Fixed the bug that Dr. Xu and Lucy might disappear. Fixed the bug that fixing stable mission will expire. Fixed the bug that after completing the mission The Poisoned Water, part of NPCs will still have stomach aches. Fixed the display error in the mission details (when the mission needs alpaca hair but shows fluffy pendant).